I, John, saw another angel come up from the East,holding the seal of the living God. I heard the number of those who had been marked with the seal, one hundred and forty-four thousand marked from every tribe of the children of Israel.After this I had a vision of a great multitude, which no one could count, from every nation, race, people, and tongue. 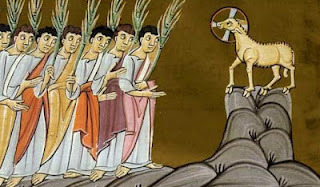 They stood before the throne and before the Lamb, wearing white robes and holding palm branches in their hands. All the angels stood around the throne and around the elders and the four living creatures.